BR: How old were you when you started playing volleyball? How old were you when you started the recruiting process? CS: I was 11 years old when I started playing volleyball. I started the recruiting process when I was 13 by setting up my BeRecruited account and posting my first video. BR: What is your biggest achievement so far that has impacted and shaped your athletic career? CS: I have received some nice individual recognition, but team achievements mean more. Finishing third at state last year only made our team hungrier. I think the best is yet to come! BR: What do you like most about competition? CS: I like the challenge of facing the best players and best teams. I want to be the best so I want to compete with and against with the best. BR: What advice would you give to fellow BeRecruited athletes about using BeRecruited? CS: Complete your profile – pics, video, stats and then use the search feature to find schools you may be interested in. BR: What are you doing to be a successful athlete? Do you have a tournament coming up? Are you working out (apart from practice)? Are you updating coaches about your achievements? CS: We have started off season conditioning for school ball and I will be attending camps in early July. I try to get better at something every day. I keep in contact with coaches on a regular basis to update them on my progress. BR: What steps are you taking to call coaches attention? Are you emailing/calling them? CS: A little of both, some coaches I email updates every few months around events such as the beginning/end of club season or school ball. I send them links the videos on BeRecruited and give them a brief update on my progress. With other coaches I email or talk to on the phone every few weeks. BR: What aspects of a university appeal to you? And why? CS: I am looking for a university that will allow me to excel on and off the court. I want to play volleyball at a high level but I am also looking for a school that will prepare me for success after volleyball. BR: What are you looking for in a college coach and college team? CS: I want a coach that can help me grow as a player and as a person. Someone who will push me to be the best that I can be. I want teammates who want to win. A group of competitors that are hungry to be better players. I also want to feel like it’s a family where the coaches and players support each other through the ups and downs - not just during the time we play together but beyond that into our lives after volleyball. BR: What would you say to a coach to convince them that you will be a positive impact on their team? CS: I am a fierce and enthusiastic competitor who wants to win every game. I work hard to make myself and my teammates better. I think my speed and athleticism allow me to play with and aggressive and explosive style on the court to impact games in a positive way. I am a team player – I don’t care who the MVP is but I want to help the team win. Carsyn is taking the necessary steps to becoming a committed athlete. 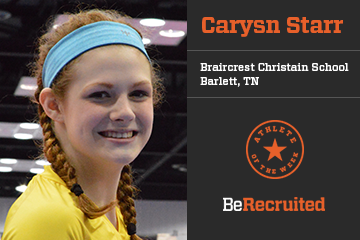 We wish Carsyn the best of luck the recruiting process!